shed o’er the world thy holy light. Our opening hymn was written by Saint Bernard of Clairvaux, the 12th century founder of the Cistercian or Trappist order within the Benedictine tradition. 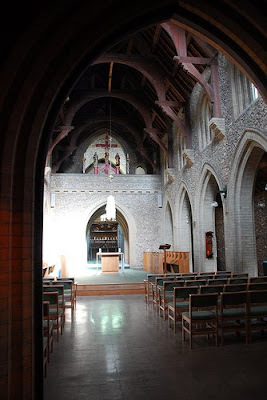 Some time ago, I spent two weeks [August 2012] in Ealing Abbey, London, studying Liturgy and Liturgical Latin at the Benedictine Study and Arts Centre, and I was invited each day to join the monks in the choir for the daily offices. There was an old cutting from the Daily Telegraph on the desk in my room in the abbey – and I referred to this a few weeks ago [17 October 2016] when we were looking at Spirituality and Sport – that says the Benedictine tradition is so rooted in English life and culture that: ‘Some claim to see the Benedictine spirit in the rules of Cricket.’ But in Ealing Abbey, I was more conscious of how the daily offices in the Anglican tradition – Morning Prayer, Evening Prayer, Vespers, Compline and so on – draw on the riches of the Benedictine tradition. 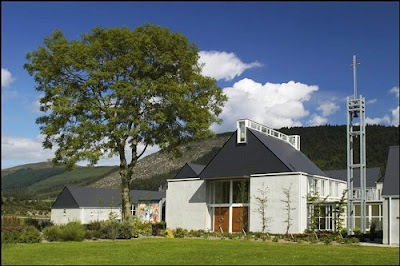 I was conscious too that at the same time some of the students here were then on retreat in either Glenstal Abbey, Co Limerick, or Holy Cross Monastery in Rostrevor, Co Down, two of the preferred centres the Church of Ireland for pre-ordination retreats. Last month [3 October 2016], in this spirituality time in chapel, [Dr] Katie [Heffelfinger] introduced us to the practice of lectio divina, which has been used by for centuries by Benedictines to pray using the Bible, and which is growing in use in many Anglican circles. Indeed, it could be said that Anglican spirituality has its roots in Benedictine spirituality, an approach to life and prayer that arose from the monastic community of Saint Benedict in the sixth century. At the beginning of his academic career, Archbishop Thomas Cranmer was a reader or lecturer at Buckingham College, a hostel for Benedictine monks studying in Cambridge. ● personal prayer with biblical, patristic and liturgical strands woven together. The Anglican Benedictine monk, blogger and theologian, Dom Bede Thomas Mudge, former Prior of Holy Cross Monastery in West Park, New York, believes the Benedictine spirit is at the root of the Anglican way of prayer in a very pronounced way. The example and influence of the Benedictine monastery, with its rhythm of the daily office and the Eucharist; the tradition of learning and lectio divina; and the family relationship among an Abbot and his community, have influenced the pattern of Anglican spirituality. On a regular basis, through the day, in the office and in their spiritual life, Benedictines pray the psalms. The church historian Peter Anson believes that Cranmer’s great work of genius was in condensing the traditional Benedictine scheme of hours into the two offices of Matins and Evensong. In this way, Anglicanism is a kind of generalised monastic community, with The Book of Common Prayer preserving the foundations of monastic prayer. As a monastic form of prayer, The Book of Common Prayer retains the framework of choral worship, but simplified so that ordinary people in the village and the town, in the parish, can share in the daily office and the daily psalms. In recent years, three of the most interesting commentaries on the Rule of Saint Benedict have been written by leading Anglican writers: Esther de Waal, a well-known writer and lecturer on theology, spirituality and Church History and the wife of a former Dean of Canterbury; Elizabeth Canham, one of the first women ordained priest in the Episcopal Church (TEC), who has lived in a Benedictine monastery, and is now living in North Carolina; and Canon Andrew Clitherow, chaplain at the University of Central Lancashire. In Ireland, the only cathedral with a Benedictine foundation is Christ Church Cathedral, Dublin, and then only from ca 1085 to 1096. In the Church of England, however, there are 13 cathedrals with a Benedictine foundation and tradition: Canterbury, Chester, Coventry, Durham, Ely, Gloucester, Norwich, Peterborough, Rochester, Saint Alban, Winchester, Worcester and York Minster – 15 if we include Bath Abbey and Westminster Abbey. Throughout the Anglican Communion, there are Benedictine communities in Australia, Canada, England, Ghana, South Africa, South Korea, Swaziland and the US. In the Church of England, they include: Alton Abbey, Hampshire; Edgware Abbey, London; Elmore Abbey, Newbury, Berkshire (founded at Pershore and later at Nashdom Abbey); Holy Cross Convent, Costock, Leicestershire; Mucknell Abbey, near Worcester (formerly the community at Burford Priory, near Oxford); Saint Benedict’s Priory, Salisbury; Saint Hilda’s Priory, Whitby; Saint Mary’s Abbey, Malling, Kent; and Saint Peter’s Convent, Horbury, Wakefield. The Cistercian Monastery at Ewell closed many years ago . Benedictine prayer became more accessible in popular culture over ten years ago when the BBC screened the television series, The Monastery (2005), in which the then Abbot of Worth Abbey, Abbot Christopher Jamison, guided five modern men (and three million viewers) into a new approach to life at Worth Abbey in Sussex. The major themes in the Rule are community, prayer, hospitality, study, work, humility, stability, peace and listening. Apart from the scripture readings that are heard in the liturgy, Saint Benedict sets aside from two to three hours a day for lectio divina, which is not an intellectual pursuit of knowledge and information but a way to let the word of God penetrate the heart and the whole person, so that we listen and open our hearts to God who speaks to us in his word. Saint Benedict begins his Rule with the word listen, ausculta: ‘Listen carefully, child of God, to the guidance of your teacher. Attend to the message you hear and make sure it pierces your heart, so that you may accept it in willing freedom and fulfil by the way you live the directions that come from your loving Father’ (Rule of Saint Benedict, Prologue 1, translated by Patrick Barry). His advice is as short and as succinct a directive on how to prepare to pray as I can find. The Benedictine motto is: ‘Ora et Labora.’ This does not present prayer and work as two distinct things, but holds prayer and work together. The chapel becomes the place for the Work of God (Opus Dei), but the work of God does not end at the chapel door. God continues to work where we work. The monastic cell is the place of solitude, but this is not a refuge from the common life. There must be time and place for both, a unity of the inner life and the outer life. Is my prayer regular, universal, converting, reflective, communal? Do I pray only when I feel like it, seeking consolation rather than risking conversion? Do I pray only when it suits me, so that I want God on my own terms? Do I pray only when it is convenient, and so make the God-life a very low priority in a list of better opportunities? Do I pray only when it feels good, only to risk finding total emptiness when I most need to be filled? 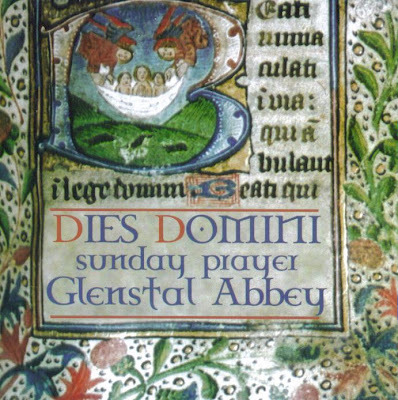 Our closing hymn is Hymn 670, Jerusalem the Golden, by the 12th century Benedictine Saint Bernard of Cluny and which was recorded at Glenstal Abbey a few years ago. Anglican Religious Life 2010-11 (Norwich: Canterbury Press, 2009). Benedictine Yearbook 2012, ed William Wright (Warrington: English Benedictine Congregation, 2011). Joan D. Chittister, The Rule of Benedict: a spirituality for the 21st century (New York: Crossroad, 2010 ed). Abbot Christopher Jamison, Finding Sanctuary – Monastic steps for everyday life (London: Weidenfeld & Nicolson, 2006). Abbot Christopher Jamison, Finding Happiness – Monastic steps for a fulfilling life (London: Weidenfeld & Nicolson, 2008). (Revd Canon Professor) Patrick Comerford is Lecturer in Anglicanism and Liturgy, the Church of Ireland Theological Institute. This lecture in the chapel on 21 November 2016 was part of the Spirituality programme within the Pastoral Formation modules with MTh students. Perhaps the most unusual building I came across during my visit to London this week was the former Turkish baths in Bishopsgate Churchyard, just off New Broad Street and close to Liverpool Street Station. From the outside, the bath-house looks like a Victorian fantasy of an imaginary Arabesque mosque, and even has a star and crescent placed above a miniature minaret. But this is not a mosque. Although the present bathhouse dates from 1895, there have been baths on this site in Bishopsgate Churchyard for almost two centuries, since 1817. By 1847, Dr Robert James Culverwell was providing medical baths here, and in 1848 he opened baths in Argyll Place, off Oxford Circus. Both establishments were known as the Argyll Baths. When he died in 1852, his widow, Ann Eliza Culverwell, continued to operate the business for about eight years or so. By March 1860, the establishment was owned by Argyll Baths, who added Turkish baths and renamed the place New Broad Street Turkish Baths. By 1883, they were owned by Jones & Co, who refurbished the baths in 1885. The baths were open from 7 a.m. to 9 p.m., and a ‘plain hot-air bath, with shower’ cost 3s.6d and the ‘complete process’ cost 4 shillings. Other services available included perfumed vapour, Russian vapour, Vichy, and sulphur vapour baths. There were scented showers, and ascending, descending and spinal douches. Jones and Co sold probably sold their baths around 1886-1889, and the New Broad Street baths were bought by the Victorian entrepreneurs Henry and James Forder Nevill as a going concern. They had already built specially designed baths in Northumberland Avenue in 1884, and they decided to close and demolish the old baths in Bishopsgate and to build new premises. The building was designed by G Harold Elphick, who is said to have been inspired by a shrine forming part of the Church of the Holy Sepulchre in Jerusalem. He designed this place using tessellating Arabic motifs in classic colours. The Nevill brothers already owned more Turkish baths in London than any other company, and this was their fifth in total – their second in the City of London. Turkish baths were popular at the time – I have written before about the former Turkish baths in Bray – and these baths were designed to appeal to people in the City of London as an underground place of relaxation and hygiene. The new building was opened by City of London Alderman Treloar on 5 February 1895. Many of the streets in the area had different names then, and the main entrance to the baths was in Alderman’s Walk, now Bishopsgate Churchyard. Architectural journals praised both the overall decorative scheme and the quality of fittings, and also the imaginative way in which a very small ground level area was utilised. The site was narrow and the building had to fit between two 19th century office buildings – now long gone. The Moorish pavilion at street level is the entrance to the bath-house below, where various side rooms offered shampooing and steaming. The baths were partly underneath the original New Broad Street House, which has since been demolished, and partly underneath Alderman’s Walk. The entrance forms part of a kiosk in the upper portion of which were water tanks, masked by a Moorish style wall, and surmounted by a similarly styled onion shaped cupola, decorated with a star and crescent. The onion-shaped cupola, winding stairs, marble-floored hot rooms, mosaics and gilt-edged décor set the building apart. There was stained glass and rich oriental rugs. Throughout the building, the walls, beams, and columns are encased with faïence and tile-work. Even the joints are worked in to form part of the design, the tiles being made in various interlocking shapes, in the Moorish manner, for this purpose. They were specially made at Jackfield in the Ironbridge Gorge, Shropshire, by Craven Dunnill to the designs of the architect, Harold Elphick, who had the shape of his interlocking tiles registered. At the top of the oak staircase leading to the baths below, and throughout the relaxation areas, were walnut screens with panels of coloured leaded glass in peacock blue and gold. The cooling-room was decorated in the style of the Alhambra in Spain. A fountain of cold filtered water, with a Doulton basin, reinforced the Moorish ambience of the interior. The room was divided into a series of divans, or cubicles, each of which was provided with couches, an elaborate mirror, and an occasional table. The ceiling was clad in cream tinted panels with coloured borders, and the floors were covered with soft richly patterned carpets. The baths managed to survive the London Blitz in the 1940s, and remained open until 1954. But he number of bathers using the baths had been declining steadily since 1950, and when the lease expired and the Nevill company decided not to renew it. The baths closed in 1954, and over the decades, the Grade II-listed building was used for restaurants, a nightclub, a pizza house and as storage space. But, despite these changes, this intriguing and captivating building managed to survive through the massive office redevelopment projects of the last decades of the 20th century, and it reopened as the Victorian Bath House earlier this year [April 2016]. The Victorian Bath House is now managed by the Camm and Hooper chain as a venue private and corporate events. The Grade II listed space hosts standing receptions for up to 150 guests and seated breakfast, lunch, dinner and private groups of 20-150 guests. However, I did not get inside the building on Friday evening. The bar is open by appointment only from Thursdays to Saturdays. But the building stands out among the modern, uninspiring office blocks that surround it.